IrisAccess 4000 is the third generation of the world’s number one deployed iris recognition platform. Offering increased application versatility and integration flexibility, enrollment and recognition is easier than ever. Intuitive visual user interface enables users to quickly position themselves for enrollment or recognition as images of both eyes are captured virtually simultaneously. Audio prompts improve speed of enrollment and recognition performance while motor-driven auto-tilt mechanism makes adjusting the camera for proper height a simple ‘one touch of a finger’ proposition. What’s more, every model of the IrisAccess 4000 contains a camera supported by dedicated illumination that makes badging for credentialling a snap. When it comes to multi-factor authentication, IrisAccess 4000 is extraordinarily flexible. iCAM4000 and iCAM4100 with optional device-embedded SmartCard readers from the world’s leading card reader producers give IrisAccess the ability to function with HID iCLASS, DESFire, and MiFARE and CAC-compliant cards. When a reader is present, a card icon placed on the casing indicates where the card should be placed for fast verification. Card reader-equipped models of iCAM4000 and iCAM4100 are designated with a 10 suffix, so become 4010 and 4110 respectively. Multifactor authentication can also be delivered by the 16-element keypad that comes standard on the iCAM4100 unit. The authentication options afforded by being able to configure iris authentication by left, right, either or both eyes plus a smartcard token, and in the case of the iCAM4100, a keypad, are simply unmatched by any other iris recognition offering on the market. iCAM4000/4010 is compact, low profile and designed with architectural aesthetics in mind. It’s kiosk-configurable, and can be flush or recessed mounted. An iCAM4010– with an embedded SmartCard reader provides more than multi-factor authentication. Information residing on the card enhances human factors performance to prompt correct setting of the imager to an individual user’s height. An option that will prompt the card to trigger language for audio prompts, will make the system ideal for use in a multi-ethnic milieu, or in countries with more than one official language. The iCAM4100/4110(SmartCard-equipped, as described above) includes a keypad accepting up to 10 digit PINs affording an additional level of two factor authentication. Every iCAM4100 incorporates a 40 character LCD, making possible communication regarding authentication status. It also fits well in human resource management applications, as upon identity authentication, keypad and display afford a means to exchange information about payroll, vacation days, shift-work, or other HR data etc. 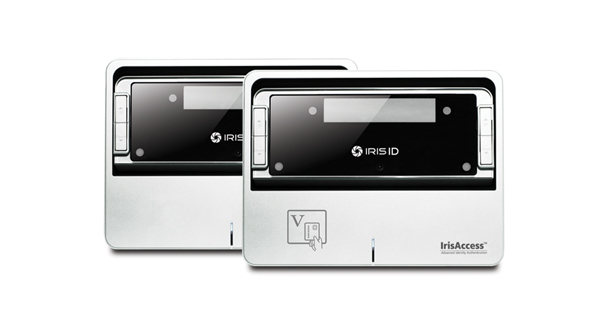 IrisAccess delivers security features and performance that set it apart from other iris recognition and most other biometric systems. Safe storage, for example, means no biometric templates are stored on any external system components. Experts concede that countermeasures built into Iris ID IrisAccess set the standard for the industry and note in this area, many other biometric systems leave much to be desired. Security is also a key driver when it comes to software. The Iris ID iData software line for access control and a tool kit for building identity-dependent applications provides FIPS compliant encryption, and offers other alternatives, as well as PKI. IrisAccess 4000 System incorporates other system-designed elements. A low profile IdentityController(ICU) offers easy greater integration convenience while ensuring that biometric templates are kept safe, protected and secure, off the imager. The DoorController(DCU) is also available for use in stand-alone access control applications. The physical or behavioral characteristics on which biometrics are based afford a more reliable basis for authentication than other easily compromised identity options relying on something one knows or carries. There are more measurable characteristics in the iris, the visible colored ring around the pupil, than in other biometrics. Every human iris is unique. Compared to other biometrics, iris recognition is the most accurate, fastest, and scalable option. Iris patterns are also very stable. Barring trauma, an iris pattern will not change over time as characteristic measurements of finger, hand, voice or faces do.